" A new energy-capturing knee brace can generate enough electricity from walking to operate a portable GPS locator, a cell phone, a motorized prosthetic joint or an implanted neurotransmitter, research involving the University of Michigan shows.
" 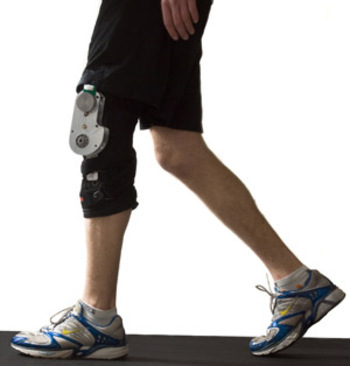 The energy harvester mounts at the knee and selectively engages power generation at the end of the swing phase, thus assisting deceleration of the joint. Test subjects walking with one device on each leg produced an average of 5 watts of electricity, which is about 10 times that of shoe-mounted devices. "